Honey, it’s an Intermediate Mass Black Hole this time! Facing trouble decrypting the title? Here’s a cue. Our universe is speculated to host a plethora of black holes, and they come in varied sizes: stellar mass (SBH), intermediate-mass (IMBH), and super-massive (SMBH). Of this assortment, SBHs, that have masses of a few to tens of times the mass of our Sun, as well as the SMBH variety that can be a million- to billion-fold heavier and found in the central engines of active galactic nuclei at large redshifts, have been studied and characterized for a long time. 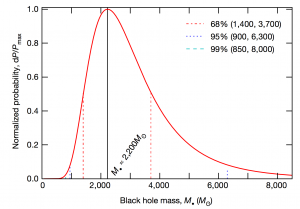 On the other hand, what remained elusive to this point, has been the existence and properties of a novel class of long-lived black holes (IMBHs), thought to represent the evolutionary bridge between SBHs and SMBHs. 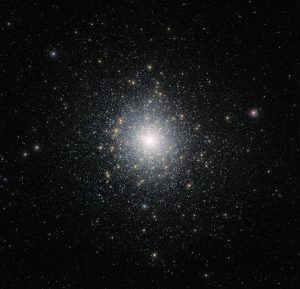 In lack of a way of creating IMBHs, scientists have contemplated various formation mechanisms for them such as collapse of extremely massive primordial stars, core collapse of the centers of dense stellar systems or merger of smaller BHs, all of which favour a dense, primordial environment such as the center of a globular cluster. Considering this, faithful observational campaigns have targeted globular clusters for many decades seeking observational signatures of these objects, but the quest so far has been rife with uncertainty, unsatisfactory upper limits, and tantalizing but inconclusive evidence. For example, kinematic modeling of the globular cluster Mayall II in Andromeda galaxy indicated the presence of an IMBH, but alternative evolutionary dynamical modeling showed that the data could be explained in absence of such an object. In 2014, IMBH candidate M82 X-2 was revealed not to be a black hole at all but rather a neutron star, while plenty of other candidates lack sufficient flux ratio in radio vs. X-ray wavelengths to match the dynamical mass estimate of an accreting IMBH. Very recently, Kızıltan et al. published the evidence of an IMBH residing – in line with previous theoretical predictions – at the centre of 47 Tucanae (or NGC 104; see Figure 1. ), one of the most massive globular clusters known. Kızıltan and colleagues made this discovery by examining the dynamical state of the cluster with the help of pulsars residing within it. (Pulsars are rapidly rotating neutron stars emitting a beam of electromagnetic radiation that appears as pulses of light sweeping in and out of our line of sight at regular and precisely measurable intervals, just like pulses from a rotating lighthouse lamp). Within a globular cluster, massive stars tend to sink towards the center. In the presence of a massive central mass (say, a black hole), as more stars sink inwards, the core heats up and stars start getting scattered off of the black hole, as well as each other. The propagation of the central black hole’s dynamical influence outwards (i.e., the inner stars scattering outer stars, and those scattering the ones even further from the center) ultimately affects the overall spatial arrangement and acceleration of stars in the cluster. Using the pulse-period measurements of pulsars to determine the distribution of their accelerations, the authors were able to infer a distinct imprint of the central massive object’s gravitational potential on the 3-D dynamical state of those pulsars. Moreover, using N-body numerical simulations of the cluster, the authors confirmed the mass of the object to be 2,200 times that of the Sun (Figure 2). This number is in vicinity of the previously established upper limit of 2,060 solar masses for the putative central object, and lies well within the mass regime of an IMBH. 1) One can study whether IMBHs can potentially host ultra-luminous X-ray sources (ULXs) that are too bright to be an accreting SBH and too distant from the centers of galaxies to be caused by SMBHs. 2) By the virtue of bridging the mass-gap between SBHs and SMBHs, a detailed analysis of IMBHs and their environments can shed light on accretionary growth models of SMBHs, and whether IMBHs can act as their initial seeds. These questions in case of the IMBH in 47 Tuc, unfortunately, remain unanswered due to the absence of any detectable electromagnetic emission from it, suggesting that it is likely lurking in a gas-deficient environment. Whether this is typical for IMBHs or an exception, will become clear in time to come as scientists continue to expand our search for more objects through the cosmos. Thank you for your informative piece re. 47 Tuc & IMBHs, Bhawna. Phrases referring to “heating” and “cooling” come up so often in astrophysics that we take it for granted astronomy enthusiasts not in the profession know what we mean. Many hobbyist astronomers equate “heat” and “cool” to what they feel on their skin. Kinetic energy as an energy transfer function isn’t always so clear. I suggest that anyone aspiring to write for the nonprofessional press draft a boilerplate phrase explaining what exactly “heating” and “cooling” actually mean in terms of energy distribution in the specific context, e.g., core collapse and rebound, or galactic disk / halo heating. The explanation can be worded so as to be inserted as needed into an article like Bhawna’s. It might be helpful, too, to draft a similar boilerplate explanation for virial phenomenon.The word “virial” is very poorly explained in ordinary dictionaries (if it even appears at all!). As a hobbyist it took me a long time to understand the maths of the virial theorem in the context of actual objects seen through an eyepiece or on an astro image. Why a black star is the alternative to a black hole. How does the Chandrasekhar limit prevent the creation of intermediate black stars? Due to a unique requirement of creating black holes by freezing time and space from the inside out, the conventional method of deriving results from general relativity could not be used. Instead I used the Newtonian model, while factoring in relativistic corrections derived from general relativity which includes relative contraction of both space and time. This mathematical model, written in Excel and Visual Basic, takes about a day to run. It calculates time dilation profiles, density cross sections and red shift factors as it forms a “black star”. I use the term black star because the calculations show that during the collapse no singularity is formed and there is no event horizon as in the accepted theory of black holes. For a remnant greater than 2.2 solar masses, while it is still contracting, this gravitational potential causes time at the center to relatively freeze and stop the contraction before the pressure gets high enough to stop it, as it would in a neutron star. Then, above this frozen matter, as the contraction continues, the time freeze moves toward the surface, stopping the contraction of the rest of the remnant, creating a black star. 6. Why is there such a large size gap between stellar black stars and super massive black stars? 7. Why are there no stellar black stars below 2 solar masses? 8. Why are there no supernova created stellar black stars above 15 solar masses? 9. Why does the smallest super massive black star start at 50,000 solar masses? 10. Are super massive black stars made before or after the existence of first-generation stars in a galaxy? These questions cannot be answered using a model of black holes that have a singularity. They are answered by this model of the formation of black stars. The information produced by this model agrees with observation when available. Calculations in my above-mentioned article, show that black stars (black holes) cannot exist between about 50 and 50,000 solar masses. I would define the nonexistent intermediate black stars as being between these two limits. This range of black star sizes requires densities of matter that cannot exist. These densities are the same as those found when matter transitions from degenerate white dwarf matter to neutron matter. I think that if black stars are suspected in this intermediate range, another explanation that does not require them, needs to be found.